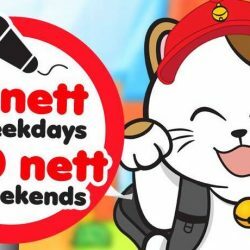 20 - 21 Jan 2019 Manekineko: Enjoy 1-for-1 Karaoke Buffet Session at Cineleisure or Sing at $10 Nett Per Pax at Tampines 1! It’s BUFFET-MANIA!!! 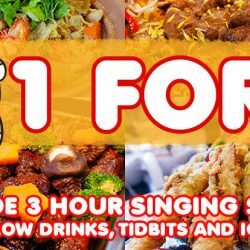 Enjoy 1 for 1 Karaoke Buffet Session now in Manekineko Cineleisure on 20th and 21st January 2019 from 6pm onwards! This promotion is including 3 hour singing session and FREE FLOW drinks, tidbits and ice-cream! Download the coupon at JPassport app for free! Or sing any time, any day, any session at $10nett only! 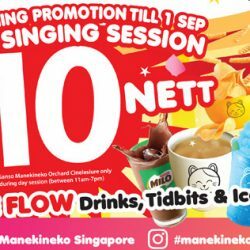 Enjoy 2 hour singing session with FREE FLOW drinks & tidbits at Manekineko Tampines 1 now at $10nett per pax! BQ: Manekineko may be more expensive than Teo Heng, the sound system's quality and buffet definitely makes it worth the price! 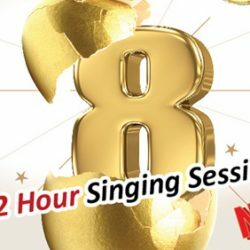 10 Apr - 5 May 2017 Karaoke Manekineko: Enjoy 2-Hour Singing Session at only $8 Nett! From 10 April till 5 May, enjoy 2 hour singing session at only $8nett at Manekineko and Kbox Karaoke outlets! Promotion is available on every weekday day session from 11am - 6pm, inclusive of FREE FLOW soft/hot drinks, ice-cream and tidbits! 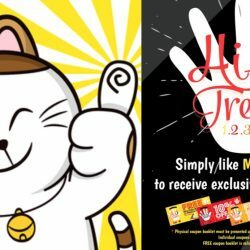 Karaoke Manekineko: Limited Coupon Booklet with Up to 50% OFF Cover Charge! Simply like MANEKINEKO Facebook Page & check-in to any singing session to receive exclusive Hi-5 Treats coupons! Coupons include up to 50% off cover charge with min. 4 pax check-in! 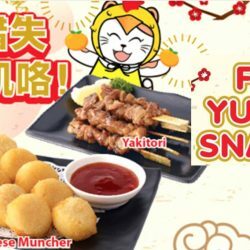 Till 28 Feb 2017 Karaoke Manekineko: FREE Golden Cheese Muncher or Yakitori When You Sing! Check in for any singing session at Manekineko and enjoy a choice of 1 complimentary golden cheese muncher or yakitori! Simply flash the promotion artwork from your mobile phone and enjoy! 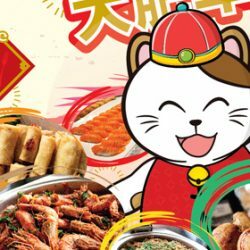 Till 28 Feb 2017 Karaoke Manekineko: Enjoy $5 OFF Per Pax for Dinner Buffet at Orchard Cineleisure Outlet! Get $5 off per pax for every group check-in of the dinner buffet at Ganso Manekineko Orchard Cineleisure! Simply flash the promotion artwork from your mobile phone and enjoy! Valid till 28 February 2017. 26 Aug - 1 Sep 2016 Karaoke Manekineko: Grand Opening Promotion at Cathay Cineleisure – 2 Hour Singing Session for $10 Nett! Karaoke Manekineko is opening a new branch at Cathay Cineleisure on 26 August 2016! 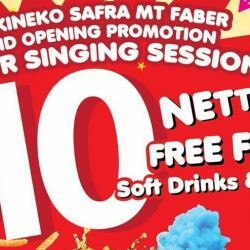 Enjoy their opening special of $10 nett (2 hour) singing from 26th August - 1st September 2016 (between 11am - 7pm). Oh yes, it includes FREE FLOW of drinks, tidbits and ice cream! 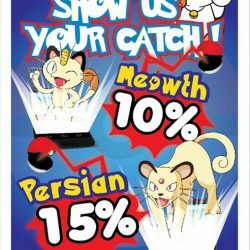 Available at GANSO Manekineko at Cathay Cineleisure Orchard, level 8. Make your reservations now at 6756 3113. Till 30 Apr 2016 Karaoke Manekineko: Grand Opening Promotion – 2 Hour Singing Session for $10 Nett! 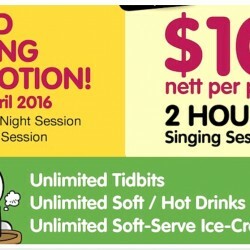 Incredibly low price singing session at just $10 nett for 2 hours with unlimited soft/hot drinks, slushies, tidbits and soft-serve ice-cream! Visit Karaoke Manekineko openings at Marina Square from 31st March and Safra Punggol from 1st April for more tantalizing event highlights! Promotion is available for all sessions from Sunday Night Session to Friday Day Session till 30 April 2016.